In response to Donald Trump's presidential victory, many people have called to abolish the electoral college and have the presidency decided by a popular vote, including several hundred thousand MoveOn.org petitioners. In contrast, I support the electoral college. Though I would find unobjectionable changes in the way the electoral college is calculated, I generally approve of the electoral college because it is one of the Constitution’s accidentally great procedural features for deterring the concentration of political power and the resulting abuses of such concentration. As described below, in addition to the electoral college, the Constitution's voting system does an unexpectedly good job of deterring the concentration of political power. Let's start with the what makes the Constitution’s voting rules accidentally great. "The smaller the society, the fewer probably will be the distinct parties and interests composing it; the fewer the distinct parties and interests, the more frequently will a majority be found of the same party; and the smaller the number of individuals composing a majority, and the smaller the compass within which they are placed, the more easily will they concert and execute their plans of oppression. Extend the sphere, and you take in a greater variety of parties and interests; you make it less probable that a majority of the whole will have a common motive to invade the rights of other citizens; or if such a common motive exists, it will be more difficult for all who feel it to discover their own strength, and to act in unison with each other." Thus, according to Madison, having a lot of people with diverse interests restrains federal power and protects liberty by deterring the formation of oppressive majorities. Since America has consistently had two major political parties instead of dozens of factions, Madison was, in a word, wrong. He overlooked the significance of voting rules. When designing the Constitution, its drafters spent considerable time considering who voted when. The Constitution makes the House popularly elected by the people, the Senate appointed by the states, the President indirectly elected through the electoral college, and the judiciary nominated by the President and appointed by the Senate. Due to a skepticism of majorities, the Constitution empowers different people to choose different components of the federal government to protect against majoritarian dangers. The question of who should decide predominates. Yet, the drafters largely overlooked how those people should be measured. In his significant (but dull) book Social Choice and Individual Values, Kenneth Arrow earned himself a Nobel Prize in economics by showing that individuals with rational preferences among multiple choices (i.e., for three choices A, B, and C, individuals who can rationally form a preference of A > B > C) will when aggregated, such as through voting, almost necessarily create collectively irrational social preferences (i.e. an outcome in which, collectively, society decides that choice A > B > C > A > B > C . . .). Arrow’s Impossibility Theorem shows that how collective decisions are measured matters as much or more than who should be included in the group deciding. In other words, the “will of the people” does not exist independently of the voting rules. Voting rules matter because the measure of "the will of the people" determines collective decisions. To have a Madisonian system with many factions that deter majorities, states would need to use a system of proportional representation in voting. Under such a rule, a party with about 10% support would receive around 10% of the seats in Congress, and Congress would need to form coalitions with many factions to pass legislation—just as Madison wanted. Currently, due to proportional representation, Spain has not had a government for almost a year because of the inability to form a coalition. Setting a world record, Belgium with its proportional representation voting system did not have an elected government for 589 days. Thus, European countries with proportional representation voting systems show how such voting rules can cause Madisonian inhibitions of government. As Madison suggests, a larger, more diverse country with a proportional representation voting system would likely have such restrains more frequently. Third party candidates can be “spoiler” candidates because of states’ first-past-the-post voting rules, leading this voting system to create and reinforce two-party systems.Throughout America, with the recent exception of Maine which just adopted ranked-choice voting, voters elect the Congressperson with the most votes—a first-past-the-post voting system. According to Duverger's law, basically political science’s only "law", first-past-the-post voting rules create two party systems because voters who diverge from established parties to vote for more ideologically favorable third parties can cause the election of the established party that they least prefer. So, even if a voter votes for Ralph Nader, George Bush may win the election—even though the voter prefers Al Gore to Bush. Third party candidates can be “spoiler” candidates because of states’ first-past-the-post voting rules, leading this voting system to create and reinforce two-party systems. Having underappreciated the significance of voting rules, Madison expected many factions and did not intentionally design the Constitution to restrain the unanticipated two-party system. A two-party system poses the danger of one party taking exclusive control and exerting its unrestrained will on the population. Though not preventing this common 19th century occurrence, the Constitution's voting procedures accidentally mitigate this danger through staggered elections. Under the Constitution, the President is elected every four years, the House every two years, and one-third of the Senate every two years. So, to control the federal government, one of the two parties probably has to be popular without interruption for at least four years—at least two election cycles—across both the population and individual states. Even in a presidential year, a popular party that seized the House and Presidency would likely not secure the Senate because only one-third of it gets elected at a time. With the schizophrenia of American voters, the federal government now tends to be split between two parties and, when controlled by one party, not remain in its control too long. Since new legislation requires the approval of the House, Senate, and Presidency, a different party only has to hold one of these entities to create gridlock and restrain federal power. Let me reemphasize the accident. Why is the House elected every two years? Among the rationales, during the Constitution’s ratification, its drafters feared a standing army. Thus, in Article I Section 8 of the Constitution, Congress received the qualified power "To raise and support armies, but no appropriation of money to that use shall be for a longer term than two years". By setting a two-year term limit to match the House’s term, the Constitution empowers the American people to defund and end dangerous uses of the army or ongoing wars. Voters only have to elect anti-war politicians in one branch of the government to restrain the army through the House’s power of the purse. In American history, this neat idea has never been used to restrict the army in such a way. In part, this constitutional protection has been overlooked because a standing army is mostly a post-1945 phenomenon and, since 1945, Congress has largely ceded its authority over the army to the President. Though the House could defund the army without the President or Senate through its control over the army's purse, this intentional attempt to restrain federal power has, at least so far, not notably done so. Though not fulfilling this intentional role, having House elections every two years has unintentionally restrained the federal government within a two-party system through gridlock. Every two years, voters can deprive any political party with concentrated power of its power by switching the House to a different party. This disperses political power because divided government empowers one party to block another party’s agenda, making the House’s two year terms a tool for dispersing political power. Most recently, this happened in 2010 with Republicans, jettisoned by Tea Party candidates, snatching the House but neither the Senate, in which only 1/3 was elected, nor the President, which had no election. Thus, House elections deprived Democrats of their federal power without concentrating power among Republicans, largely disabling both Democrats and Republicans for the next six years. Some commentators named the resulting gridlocked Congresses the “Worst Congress Ever” due to the inaction–-apparently forgetting that Congress has passed many, terrible, horrible, no good, very bad laws in American history, including in recent memory, when the political system has not restrained the federal government in such a way. Similarly, with Republicans now poised to hold the House, Senate, and Presidency, the House’s two year terms give Democrats a quick opportunity to disperse Republican power in 2018. Overall, the staggering of elections in a two-party system both deters the concentration of political power and facilitates the dispersion of concentrated political power, accidentally restraining federal power in a two-party system in a similar way to Madisonian factions. In addition to election voting rules, the process for judicial appointments also partially defends against the two-party system. The Constitution sought to disperse political power by having the President nominate and the Senate confirm federal judges for lifetime appointments. When different parties control the Presidency and Senate, this division of power somewhat disperses concentrated political power by promoting the nomination and confirmation of more moderate, generally acceptable nominees who, whatever their other merits or demerits, do not seek to concentrate one party’s political power. More significantly, the lifetime appointments designed to insulate the judiciary from the political process inadvertently function like staggered elections, deterring one party from concentrating its control over all three branches. A typical two-term President will appoint three or so Supreme Court Justices, preventing a single President from appointing a full majority of the Supreme Court. When one party in power appoints Supreme Court Justices and then loses its power, those Justices remain in place to restrain future administrations with different ideological predilections. For a party to appoint anew a majority of the Supreme Court's Justices, the political party would likely need to retain both the Presidency and the Senate uninterrupted for at least ten or so years - making the concentration of political power in one party difficult and restraining potential abuses within a two-party system. An intentional rule for dispersing political power in a two-party system might have taken the form of nine Supreme Court Justices with 18 year terms—or 11 with 22 year terms or something similar. Such a system would intentionally disperse the concentration of political power by capping the number of Supreme Court Justices a single, two-term President could appoint at less than a majority. A lifetime appointment unintentionally functions similarly. The Constitution creates a federal government that disperses political power through staggered elections and judicial appointments that hinder one party from controlling the House, Senate, Presidency, and Supreme Court. In the 1930s and 1940s, under President Franklin D. Roosevelt, the Constitutional procedures that accidentally restrain the two-party system failed badly, showing by contrast the significance of these restraints. Beginning in 1933 in the depths of the great depression, Roosevelt became President with a Democratic House and Senate. The Democratic party retained control of the House, Senate, and Presidency from 1933 through his death in 1945, irrespective of large losses in 1938. Over this time, one party controlled the federal government and one man controlled the presidency for twelve consecutive years. As historians recount, his one party rule initially faced a single institutional obstacle—a Supreme Court willing to declare his legislation unconstitutional. In 1937, he threatened to pack the Supreme Court, but Congress rejected his plan. Though many people at the time believed that Justice Owen Roberts changed his vote due to Roosevelt’s court-packing plan, the so-called “switch in time that saved nine”, Justice Roberts changed his vote before the announcement of the court-packing plan, and the Supreme Court just publicly announced his switch after Roosevelt’s affront to separation of powers. Regardless, historians fixating on Roosevelt’s intentional court-packing plan overlook the gradual and dangerous concentration of political power that empowered Roosevelt all the same. By his fourth term’s end, Roosevelt had appointed eight of the nine Supreme Court Justices—completing the Democratic party’s concentration of political power. By retaining power for a dozen years, Roosevelt’s uninterrupted control outlasted the staggered election process and gave Democrats control of the House, Senate, Presidency, and Supreme Court. With his uncontested power, Roosevelt issued Executive Order 9066 and interned over 110,000 Japanese Americans. He signed Public Law 503 to enforce his executive order after his Democratic party discussed it for an hour in the Senate and a half hour in the House. And the Democratically-appointed Supreme Court affirmed the internment camps’ constitutionality by a 6-3 margin in Korematsu v. United States. Many constitutional law scholars express dismay that the decision in Korematsu upheld racial discrimination against Japanese Americans using a strict scrutiny standard of judicial review because strict scrutiny usually protects minorities. They feel this shock partially because constitutional law textbooks tend (with few exceptions) to be organized by topic instead of in chronological order. Whereas organizing by topic perpetuates the myth of the rule of law by emphasizing mangled legal arguments, a chronological and institutional focus much better explains terrible Supreme Court decisions. Focusing on the Justices’ identities instead of their legal arguments, the only remaining Justice on the Supreme Court appointed before Roosevelt’s presidency, the above-mentioned Justice Owens, voted against Korematsu as a lasting hindrance to the concentration of federal power by one party. America will hopefully never have to experience again the unusual, dangerous degree of political power exercised by President Roosevelt.Of the eight Supreme Court Justices Roosevelt appointed and his party confirmed, Justices that Roosevelt intentionally nominated to rule in favor of the Democrats’ federal agenda, six of the eight—or 75% of them—sided with Roosevelt. Korematsu and the internment of Japanese Americans is the culmination of a dozen consecutive years of one-party rule. Many people today fear that Donald Trump will do terrible things as President, as do I. Fortunately, though, the twenty-second amendment now limits the President to two terms, a particularly useful institutional restraint on the concentration of political power. Due to it, despite his desire to mimic Roosevelt, Trump likely does not have enough time to do anything as “great” as President Roosevelt’s mass internment of Japanese (and Italian and German) Americans. Even if Trump retains a Republican Presidency, House, and Senate for eight years despite the relative ease of changing the House’s party control, the eight-year limit likely prevents him from also controlling the Supreme Court with its more staggered appointment process. With this limitation, America will hopefully never have to experience again the unusual, dangerous degree of political power exercised by President Roosevelt—no matter how much Trump may seek to make America great again. Within this narrative, the electoral college safeguards against the concentration of political power by one party because of its accidental operation within a two-party system. At first glance, the electoral college seems like an arbitrary way of electing somebody to be President based on a close correlation to the national popular vote. Yet, with Trump winning the electoral college but losing the popular vote, the electoral college and popular vote diverged in this election for the fifth time in American history. Thus, many people wonder why we have the electoral college. As originally envisioned, the Constitution includes an electoral college to insulate voting from the majority and enable wiser electors to choose the President. By doing so, according to Alexander Hamilton in Federalist 68, the electoral college would avoid “tumult and disorder” by ensuring that the small number of people who “possess the information and discernment requisite to such complicated investigations” would decide the President. In practice, electors almost always vote based on state popular votes. Trump will win the electoral college regardless of calls for electors to defect against Hamilton’s nightmarish “man who is not in an eminent degree endowed with the requisite qualifications” for President. Despite occasional defections, such as Roger MacBride casting his electoral vote for Libertarian candidates John Hospers and Tonie Nathan in 1972 and thus giving a woman her first electoral vote, the rare electoral college defections do not affect presidential elections. Much like the belief that factions would restrain federal power, the belief that the electoral college would enable wiser electors to decide the President has proven illusory. The electoral college within a two-party system a means of restraining voter fraud and the potential resulting concentration of political power.Regardless of the original intention, within a two-party system in a large nation, the electoral college has an important function: it transforms elections from one national election into 51 local elections. With the elections managed locally, the federal government has little control over the voting process and cannot systemically tilt the election in favor of a party in power, preventing any party from systematically expanding its power through the voting system. Thus, the electoral college protects the voting system from potentially systemic federal corruption by dispersing it across the states. Moreover, by having 51 local elections for electoral votes instead of 51 local elections that sum into a national popular vote, local politicians do not have a powerful institutional incentive to tamper with the voting system and commit voter fraud to concentrate power in their political party, making the electoral college within a two-party system a means of restraining voter fraud and the potential resulting concentration of political power. Consider by example. In Texas, Republicans control the Governorship and 2/3 or so of the state House and state Senate. Similarly, in California, Democrats control the Governorship and about 2/3 of both the California State Assembly and the California State Senate. In Presidential elections, Texas casts its electoral votes to the Republican, and California casts its electoral votes to the Democrat. If presidential elections were based on the popular vote instead of electoral votes, though, then Republican Texas politicians would have a powerful incentive to manipulate the voting system in favor of the Republican presidential candidate because the additional votes could matter nationally, and politically powerless Texas Democrats would lack political recourse. Democrats in California would have a similar incentive. Political tampering with the voting system could happen in various more and less seemingly legitimate ways. Since young people tend to vote Democrat, blue states would likely see their voting age fall to 17, 16, or lower, and red states would see it stay at 18. Similarly, since felons tend to vote Democrat, blue states would probably expand voting rights for felons, and red states would further restrict their voting rights. Since voter identification laws tend to reduce minority turnout and hurt Democrats, red states would probably expand voter identification laws and blue states would probably reduce them. I am surely overlooking other creative ways that partisan politicians could justify expanding or contracting voter suffrage. Whatever dispassionate reasons exist for such voting laws and restrictions, the interaction of a nationwide popular vote and states with one party rule would create powerful institutional incentives for partisan rather than impartial reasoning to determine the voting rules, facilitating the concentration of political power among whichever party more successfully manipulates the voting process. In addition to the above tampering with the voting system, politicians in red and blue states could have both the political power and the incentive to engage in outright fraud to empower their party. Considering how creative and manipulative these politicians have been in gerrymandering, such as in Texas and California, politicians governing a one party state within a two party nation would likely manufacture many legal and illegal ways to enhance their party’s national popular vote. Thus, by creating 51 contests instead of a national popular vote, the electoral college deters red and blue states from tampering with the voting system and concentrating federal political power within their party. Unlike Texas and California, “swing states” with close votes in presidential elections also more frequently either currently have or recently have had divided governments. In these states, both parties likely have enough political power to restrain the other party’s abuses. For example, my home swing state of Pennsylvania has a Republican legislature and a Democrat Governor. Additionally, since states like Pennsylvania are known to be swing states, people can monitor them more closely for systemic corruption, a much easier proposition than monitoring all voting booths in the country. With political power divided between the two parties and more careful nationwide monitoring, neither the Democrats nor the Republicans can likely systemically concentrate their party’s political power through legal or illegal manipulation of the voting process in swing states. The electoral college protects against politically corrupt voting systems by shifting elections to places with divided governments and more reliable voting. Interestingly, the above electoral college defense reverses the historical case for it. Rather than having Hamilton’s politically astute elites choose the President, the electoral college disperses power by protecting Presidential elections from partisan political elites. Arguing against the electoral college, constitutional law scholar Akhil Reed Amar has recently challenged its proponents to explain why a popular vote is “good enough for the governorship of Texas or California” but not “the presidency of the United States”. Given his well-respected stature as a constitutional law scholar and his thoughtful analysis that acknowledges “the possibility of unintended consequences of even well-intentioned reform”, I would like to explicitly answer his question. In governor races, winning a state by a 5% or 10% or 30% margin has the same result—whether by an inch or a mile, the governor wins. In Presidential races with a national popular vote, the margin of victory within a state would matter because the entire margin affects the national popular vote. States can reliably manage governor races, but one-party states within a two-party nation would have corrupting incentives to expand margins of victory in presidential races—and also have the political power to do so. Therefore, the repeal of the electoral college would likely have harmful unintended consequences because one-party states would have a powerful incentive to manipulate the voting system to expand their presidential party’s margin of victory, an incentive they do not have in the case of governor races. To conclude, let me clarify the scope of the above electoral college defense by rejecting a common argument for it. According to some electoral college proponents, the electoral college beneficially forces candidates to focus on the nation as a whole instead of particular regions, leading to more moderate candidates with greater national appeal. Under this reasoning, without the electoral college, Republicans may focus on Texas and Democrats on California, ignoring most of the rest of the country in a way that could delegitimize the presidency. This counter-negative may or may not be true. When votes matter equally nationwide, politicians may find it similarly efficient to earn another vote in Pennsylvania as in Texas because the relevant “swing” would switch from swing states to swing voters. If the swing voter is the median voter in Pennsylvania and the 67th percentile voter in Texas/California, politicians may or may not find it noticeably easier to sway the Texas/California swing voter than the Pennsylvania swing voter or to expand voter turnout in Texas/California than in Pennsylvania. Electoral campaigns, and not imaginative predictions, would determine how best to increase a candidate’s votes. For argument’s sake, assume the empirical claim. Here is a map of the 2016 presidential election by county. 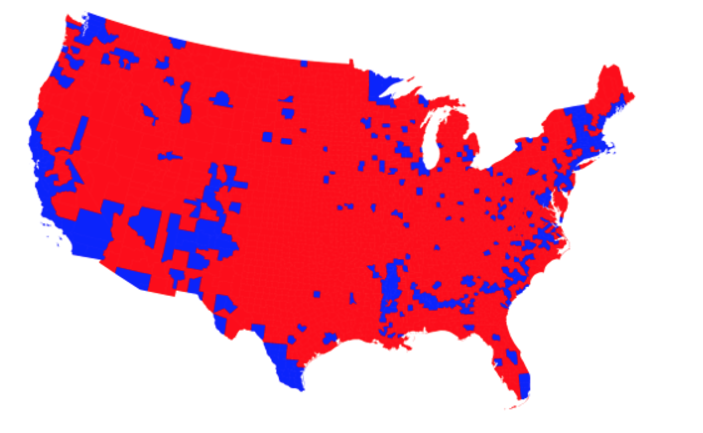 As seen in the above map, Republicans overwhelming won America’s counties and carried rural America. In contrast, Democrats won substantially fewer counties and compensate by winning populous, urban cities. If the outrageously strong bubble that separate rural red tribes and urban blue tribes under the present system is tolerable, then, by comparison, any successful regional presidential candidates must also be tolerable because Democrats already win elections with a trivial fraction of America’s regions. The electoral college contributes by deterring any one party from systemically controlling the presidency through its tampering with the voting system.The above electoral college defense focuses on dispersing political power within a two-party system. With this realization, the electoral college can correlate better with the popular vote without removing the above described beneficial features. A simple electoral college reform would be to change the number of electors per state from the present total, the House plus the Senate, to instead just be the number of House members—thus subtracting two electoral votes from each state (and the District of Columbia). This change would make each voter’s vote power within the electoral college roughly the same without threatening the systemic concentration of political power within any party. Note that I have not checked which, if any, elections would have had different outcomes with this alternative electoral vote calculation because such an effect is immaterial to this essay’s argument. Moreover, as a practical matter, small states with Senate power would likely prevent this change just as fervently as they prevent changing the electoral vote to a national popular vote because this change would somewhat reduce their political influence. Yet, whereas I support the electoral college over a national popular vote, I would negligibly support a constitutional amendment that altered the electoral count in the above-described way. More significantly, institutions matter more than specific electoral outcomes. The institutions that determine how the House, Senate, Supreme Court, and President are decided accidentally restrain the federal government within a two-party system by dispersing political power between both parties. The electoral college contributes by deterring any one party from systemically controlling the presidency through its tampering with the voting system. Sean J. Rosenthal is an attorney in New York.